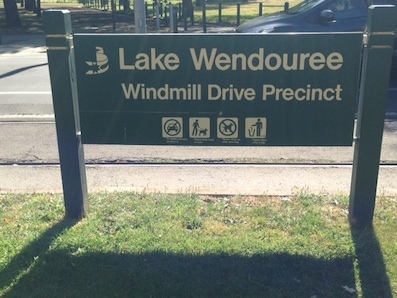 Lake Wendouree should perhaps be known as "go away lake" if old legends are to be believed. However this is one sentiment that does not ring true today. In fact the act of getting your kids away once they have set eyes on this massive timber adventure land is much more of the challenge. 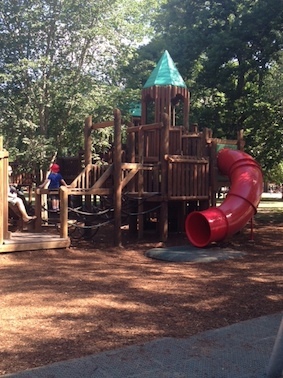 Unlike the squatter William Yuille who back in 1838 was not greeted with enthusiasm, this playground offers much to welcome and entice families and kids of all ages. 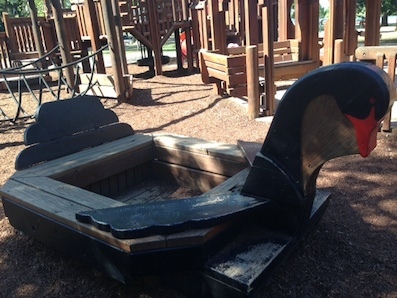 Situated in the centre of Ballarat and the middle of their glorious Botanical Gardens, the playground perches on the foreshore of beautiful Lake Wendouree, which has been a major destination for social activity for over 150 years and is as popular today as ever before. There is much to be explored and enjoyed and a small pitstop can easily turn into an hour or two full of discovery and imaginative play. There are all the usual suspects that bring a smile to kids faces, such as slides that turn and twist, many walkways and thin corridors which make for a challenging game of hide and seek, as well as a flying fox, balance beams, monkey rings and a game board of tic-tac-toe. There are also eight swings, plus a liberty swing too. With so many on offer, chances are your wait will be minimal, but it certainly does reflect the popularity of this play area. Along with the more structured play, there are a handful of options that will have children creating, role playing and building stories born from their imaginations. There is a spacious sandpit to dig and burrow in, a wooden train to travel to undiscovered territories, towns and worlds, a teepee to live in and even a boat that looks like a beautiful black swan to float down rivers that no one has ever travelled on before. 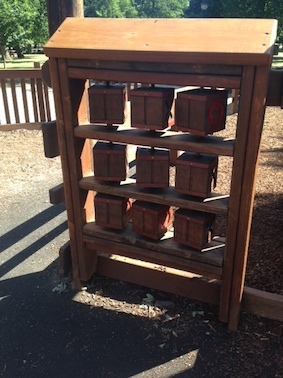 These are some of my favourite inclusions at the Lake Wendouree playground and watching your kids bring these structures to life is amazing. There is plenty of shaded and unshaded areas close by with your option of shade sails or big old leafy trees. There is also plenty of room to picnic on rugs or use the tables and barbeques provided instead. Toilets and water taps are available too. You will also find an ice-cream van parked at the front of the area which has been decorated to look like an old tram, which is quite delightful if you feel like a little refreshment. Alternatively a sweet cafe Pipers by the Lake, is situated near by for more sophisticated fare. There is actually very little reason to leave the park area at all. Of course, if you do wish to explore the area further there is a myriad of opportunities and activities to have a go at. 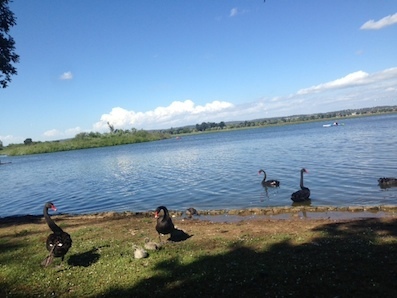 Why not watch the swans wander about lakeside or join in on a water activity like rowing or fishing for Rainbow trout. There is a historical old tram that takes you up and down the main street and conveniently a Tram Museum too. Finally, if you still have energy to burn, take to the Steve Moneghetti walking/running/riding track and enjoy the lake in its entirety. Whatever you decide to do you can rest assured that this hub of activity will keep everyone happy and busy for hours and will have you returning time and time again and the only thing being told to "go away" will be the approach of home time.